Three of the four Blizzard-made custom maps for StarCraft II are now available for open testing. Back at BlizzCon 2010, we learned that the PC developer was busy working on four custom map minigames for StarCraft II using the built-in map editor as a way to understand the difficulties modders were facing. They ended up being pretty fun, too. Three of those four maps - StarJeweled, Aiur Chef, and Left 2 Die - are now available on the Battle.net Custom Games section for open beta testing. The fourth, of course, is the big one: Blizzard DotA is expected to take much longer than the others because it's significantly more involved. Aiur Chef is a silly little action title that has Zealot chefs running around collecting ingredients to make haute cuisine. StarJeweled continues the PopCap/Blizzard unholy alliance by melding Bejeweled's match-three gameplay with StarCraft PvP action - with some Puzzle Quest thrown in on top. Left 2 Die is a cooperative take on StarCraft II's superb "Outbreak" mission, otherwise known as "that zombie mission" that has players collecting resources and upgrading their gear by day, and hunkering in to defend against zombie attacks by night. Each round of Aiur Chef features a theme ingredient and three succulent recipes that play upon its unique flavor. Before you can master these themed dishes, though, you'll first need to scout across the map and collect a variety of tasty ingredients (including the theme ingredient). 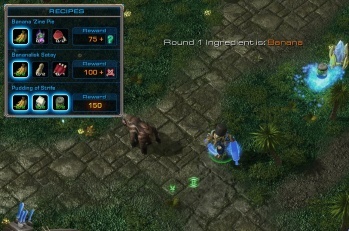 Each recipe has its own set of required ingredients, listed in the recipe menu in the upper-left of your screen, which can be picked up off the ground or acquired by killing specific creatures. Don't get too greedy when loading up on ingredients, though -- inventory space is limited, so you'll want to focus on collecting ingredients for one recipe at a time. Once you've collected the proper ingredients, you'll need to return to the kitchen in the center of the map and use the Beacon to prepare your dish. Each dish created using the theme ingredient will award you points based on the complexity of the recipe. Some dishes even award special one-time use abilities like Hearthstove, which allows you to quickly port back to the Beacon, and Decoy, which places a fake theme ingredient on the ground for other players to scavenge. Take advantage of these abilities whenever possible, as they could provide the competitive edge you need to outcook your opponents. The player with the most points at the end of three rounds will be named Executor Chef, culinary guru of the entire Koprulu Sector. With such a prestigious title on the line, expect some fierce competition... and get those psi blades ready! StarJeweled focuses on matching groups of jewels according to color and strategically selecting StarCraft II units to overcome an opponent's forces and destroy their base. StarJeweled can be played several ways, including cooperatively against the A.I. or competitively against other players. Each successfully matched jewel combination provides a burst of energy; the larger the jewel combo, the bigger the energy burst. This energy can be spent to train a variety of StarCraft II units, including zealots, banshees, and ultralisks, which will help you eliminate your opponent's defenses. You can also use energy to cast spells that heal friendly targets and do damage to enemy units. To activate a unit or spell once you've gained enough energy, simply click on the corresponding icon located beneath the jewel board. Left 2 Die is a cooperative take on the StarCraft II: Wings of Liberty campaign mission Outbreak that shifts between two phases: a night phase and a day phase. At night, you and a teammate are tasked with protecting your base against waves of infested terrans. In order to survive, you'll need to use defensive structures like bunkers and coordinate your defenses against the invading zerg armies. You'll also want to watch out for special zerg units such as the Kaboomer and Stank that can perform unique and powerful abilities capable of overwhelming even the strongest front lines. During the day, the attacks on your team's base will cease, giving you and your teammate time to train additional units and take them out to destroy infested terran settlements scattered across the map. It's also a good idea to continue building up defenses during the daytime so you can survive the merciless onslaught of zerg that swarm your base at night. I played a round or two of Aiur Chef and found it pretty fun, and I haven't touched Left 2 Die yet, but I did spend a bit of time with StarJeweled. And by that I mean I started playing around midnight, then looked up at my clock and saw that it was 3:30 AM. Whoops.